When you want to backup your important data on an external medium (hard disk, USB key, ...), there is a security problem that appears : the potential theft of this copy. To solve this security problem, there are several hardware and software solutions depending on the medium on which your data will be stored. Nevertheless, the hardware solution will always be better than the software solution. - compression of files with winrar, 7-zip, ... with the possibility to encrypt the desired data with a password. - use Truecrypt to create an encrypted volume that is only accessible with the correct password. - use Disk Cryptor to encrypt your USB key or the partition of your external hard drive. All these software solutions have the same disadvantage : they use the resources of your computer for the encryption / decryption of the data on the fly (in real time). 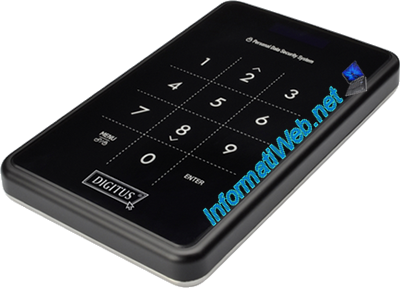 In this article, we will introduce the Digitus Secuport for 2.5" external hard drives. Note that there are 2 cases very similar to the Digitus Secuport : Zalman ZM-SHE500 and StarTech S2510BU33PW. In this case, you can also put an SSD if you want. The advantage of the SSD is that it is composed only of memory chips (flash memory). It allows you to back up your data much faster than with an external hard drive and is much less sensitive to shocks. This will allow you to keep your backup on you without any risk. As you can imagine, this case allows you to store data on a 2.5" external hard drive or a SSD in a secure way thanks to his hardware encryption (AES 256-bit). Indeed, it's the controller inside the case that will encrypt and decrypt the data on the fly. - the ability to encrypt a large amount of data. The only limit is the thickness of the 2.5" hard drive or of the SSD that you will put inside. - it allows you to keep an encrypted backup of your data on you. However, if you want to keep it in your pocket throughout the day, we recommend you to put a SSD that is much less sensitive to shocks. Unlike conventional hard drives that will spoil very quickly (the drive head of the hard drive will spend its time tapping against the disk at each shock). To use this case, you must first place a 2.5" hard drive or an SSD inside. To do this, simply unscrew the screws on the back of the case and then connect your hard disk or SSD to the gray connector inside the case. Note that the 2.5" hard drive or the SSD you add must not be thicker than 9.5mm. If your SSD is thinner, then add a few pieces of paper to fill the empty space. This will prevent the SSD from moving in the case. Then, close the case and connect it, preferably, to an USB3 port of your computer with to the cable supplied with the case. Note : if you don't have an USB 3 port on your computer, plug it into an USB 2 port and also plug the power cable supplied with the case. When you plug in your case, the case will ask you if you want to use a password (and therefore enable data encryption for the hard drive or SSD present inside). Answer 0 (for no) or 1 (for yes and to enable encryption). 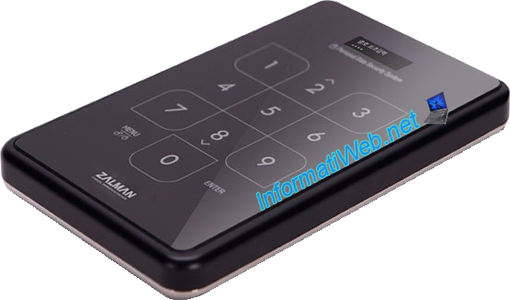 If you answer 0 (no), the case will work as a normal case and you will be able to store data as on a conventional external hard drive. If you answered 1 (yes), the case will ask for the password you want to use to encrypt your future data. Caution : by enabling encryption, the data currently on the external hard disk will be permanently lost. When the message "Enter a password first time" appears, enter the desired password (between 4 and 8 digits). Then, the case will ask you to confirm this password. Finally, a master key will be displayed once. This is a 16 character string that will allow you to recover your data if your password is lost. Nevertheless, this code can only be used by the company that created this case and not by you. Note : this key is unique for each hard drive. Press any key to make it disappear. Then, the message "LOCKDOWN" will be displayed. Because the hard disk is encrypted, Windows will no longer recognize the file system used on this hard disk. To be able to use your hard disk, you must initialize it again and repartition it. Then you can store data as you would with a conventional external hard drive. As long as the case is connected to the computer and it's unlocked, its data are accessible by Windows. For your data to be safe again, you must lock it again. - use the "Eject ..." icon in the taskbar (as explained here). - or by pressing and holding the "Menu" key on the case for 2 seconds. If the hard disk has been disconnected from the computer, the message "HDD Disconnection" will be displayed and you can disconnect it physically. To unlock the case and access your data, simply plug in the case and type the password set before. Then, press "Enter" and wait a few seconds. Windows will recognize your external hard drive and your data, and the message "LOCKDOWN" will be displayed on the case. Note that after 3 incorrect passwords, the timeout for specifying the password will lengthen with each failed attempt.